Summer vacation…. now is the time to start planning for it. …but it’s just about time to start planning for summer. I’m serious! Now is a great time to start looking for vacation package deals. Cruises, tours, hotels and airfare all are going on sale. It pays to be somewhat flexible with your dates and to book at slightly off times. Orbitz, Expedia and other bargain travel sites are great for finding good deals on travel. Living Social, Groupon and Jetsetter are all services you can sign up for and get daily deals sent right to your inbox. Flexibility is key for taking advantage of these deals. If you want to save on hotel accommodations, I would highly recommend giving airbnb.com a try. Type in the city you’re interested in visiting and check out all that is available and the amazing prices. If you are a camper (like we are) make sure you know how far in advance you can make your campsite reservations. We book our big camping trip at a California State Park. Their reservations can’t be made any earlier than 7 months out… which means that we can’t book our July trip until January 2. Our campground is a popular one and it fills up pretty quickly. Knowing those dates helps to ensure we get the sites we want, when we want them. We camp with other families, so anytime you’re trying to book a block of anything (rooms, campsites, tables….) it pays to do it early. Reserve America is easy to use for this, and there are lots of KOA Kampgrounds across the country as well. 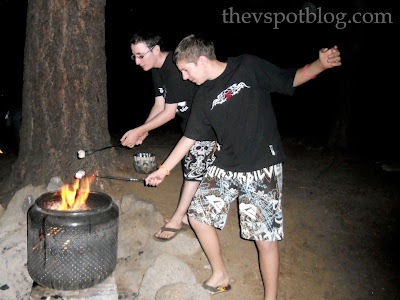 Be sure to check out the KOA Campfire Community. It’s a great resource for camping and outdoor enthusiasts. We’ll be having a Live Chat about planning for your 2012 vacations on January 5th, 10:00 pm EST. Hope you’ll join us! I know you will be shocked to hear this but I’m going to California TWICE this year. Once to meet you and then again a month later! Great advice! We are hoping to go to Italy next year plus 2 small USA based trips… we are slowly starting to look at airfare and hotels! I would like to visit that place where the first picture was taken. But not next summer, next week. Great tips, thanks! Viv – first off, I hope you had a wonderful Christmas! And second – are you as all put together in real life as you are on the blog? Because, and I know I have mentioned this before, but you’re sort of my idol. Thanks for the great links, I’ll definitely be referring back to them in the near future! As I sit here surrounded with 24 inches of snow…a summer on the beach sounds divine!! !